Indonesian Folklore can be described as Indonesian traditional art, literature, knowledge, and practices that are passed on in large part through oral communication and example. By keeping these old folktales alive, the next generations will know the stories and learn the wonderful meanings behind them. Kancil or Mouse Deer is one of the most popular animal story in Indonesian Folklore. Mouse deer usually portrayed as a clever animal that tricked other animals to fulfill its needs. 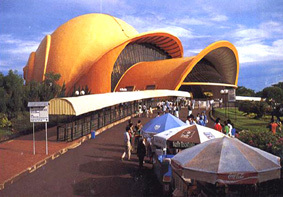 Other famous tale is Keong Mas or Golden Snail, The Golden Snail theatre at Taman Mini Indonesia Indah is one of the best theatre in Indonesia. The mythical animal such as Dragon and Garuda. Garuda is the national symbol of Indonesia.